It’s been 18 months since the Nationals star pitcher Stephen Strasburg, 22, underwent Tommy John surgery,, or reconstruction of the ulnar collateral ligament (UCL). Strasburg spent aa year on the disabled list, but now appears to be pitching as well as he di d before the elbow injury. Orthopedic surgeon Frank Jobe performed the first UCL reconstruction 37 years ago on Dodgers pitcher Tommy John, whose name become synonymous with the procedure. Johns, Strasburg and many others who have undergone UCL reconstruction have one thing in common: a mechanical flaw in the timing of their deliveries. 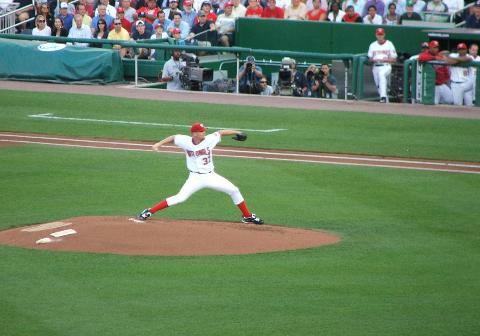 The improper technique causes the arm to lag behind the rest of the body, which puts extra stress on the shoulder and elbow. “The timing is subtle,” says the Glenn Fleisig of the American Sports Medicine Institute. Fleisig has analyzed more than 2,000 pitchers and is on of the world’s foremost authorities on the biomechanics of pitching. The top risk factor for UCL injuries is poor mechanics, according to Fleisig, followed by overuse. Overuse and poor mechanics makes for big trouble. “Force of Habit” is an excellent article on the exact pitching motion flaws that lead to this injury. And pitchers interested in having their mechanics evaluated should contact Fleisig at ASMI.